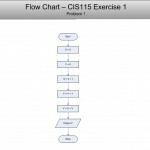 TCO 1—Given a simple business problem, design and desk-check a solution that is expressed in terms of pseudocode, flowchart, and/or input-process-output (IPO) diagrams. 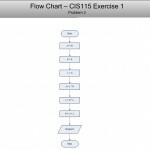 This activity will assist you in the understanding of how output should appear after statements are executed (results) and how to write proper pseudocode, as well as the relationship between pseudocode, flowcharts, and programming language code. 1. Show the result of each pseudocode program. 2. 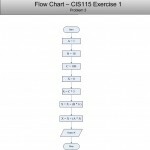 Also rewrite the pseudocode statements or flowchart using Assignment statements. When completed, compile the following documents neatly in order. The variable A starts with value 5. Display the value of A on the screen. The variable X starts with the value 0. The variable Y starts with the value 5. Add X and Y, and store the result in Y. Display the value in Y on the screen. The variable J starts with the value 10. The variable K starts with the value 2. The variable L starts with the value 4. Store the value of J times K in J. Store the value of K times L in L.
Add J and L, and store the result in K.
Display the value in K on the screen. The variable A starts with the value 1. The variable B starts with the value 10. The variable C starts with the value 100. Store the value of C times 3 in X. Add the value of B times 6 to the value already in X. Add the value of A times 5 to the value already in X. Display the value in X on the screen.